When I was younger- in my twenties and even early thirties, I would finish entire projects in a day or so, deep clean an entire apartment thoroughly from top to bottom in one day, and pretty much felt I had things together by the time I was nesting and pregnant with Audrey. Everything was pretty well prepared and organized. But in less than two years I had my first child, moved two times, and then my husband died- and somehow I’ve never managed to “get back on track.” My to-do list in those early days was very basic- things like: breathe, get out of bed, feed child. By the time I felt ready to “tackle” things again, I assumed I’d be able to accomplish them the same way I had always done, with the same level of energy and intensity. But that never happened. After being in survival mode for so long, I have now accepted the realization that I’ll never feel the way I did right before Audrey was born-together, organized, ready. Ever. Again. I’ve had to let go of my obsessive compulsiveness. I’m satisfied to do the dishes every night and make the bed in the morning. I still always have a list of larger projects and goals that I’m working on, but they take- well, years. The point of this brief meditation is that that’s OK. It’s not because I’m lazy or because I’ve given up. Actually- what I’ve noticed is that I do eventually get things done. It just takes persistence and patience to keep chipping away at something little by little over the course of many months- and not give up. The fact is that being an only parent I just don’t have the time I once did to complete things or clean the house- and those things have also come to matter less to me. But the things that do matter: spending time with and loving my child, pursuing my craft and calling in the world- often don’t have any immediate results that you can tabulate and get that sense of satisfaction from. But…progress. A little over a year ago, I wanted to create a new blog but I was having trouble getting it started. Now I’ve written consistently for over a year. Despite her apprehensions two summers ago to learn how to ride a bike, Audrey hopped on and learned in a day or so this past summer. Three years ago I started feeling like it was time to move and exercise again. I started with yoga at a local Y where people were mostly in their 70’s and 80’s. I progressed to a more middle aged group of yogis at a nearby yoga studio. And then to an even more challenging yoga studio, and this fall I started walking daily- and later when I felt stronger, I added running- if I felt like it- which I do most days. When my husband died, I immediately had a clear vision that I should ask people who knew him to write letters so that I could put them all together in a book and one day Audrey, only 21 months old at that time, could read them. A friend had people email her the letters- and eventually she sent them all to me- where they sat, hundreds of them, in my email inbox mostly unopened for…years. But after four years, I had the strength and time to make the book. 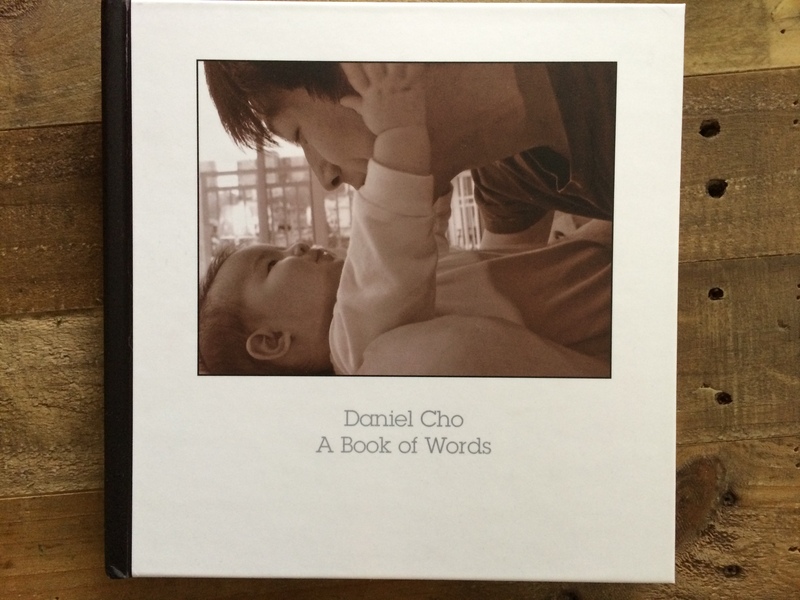 I spent hours going through the letters- an emotionally draining task- and completed the book on Shutterfly in time to give a copy to my husband’s mother when she was visiting from Korea last year. It took another year before I ordered a copy for our own house- and finally- that vision became a reality. My daughter, age 7, sat flipping through the book, even showing her friends when they came over. I posted pictures of the pages on Facebook on his birthday this past December so that friends who had written those letters could see what had become of them. Something about grieving and raising a child at the same time warps your sense of time, and years don’t seem that long anymore at all. The important thing is that I don’t forget about my goals – I write them all down in a pretty pink linen binder every year or so by category- and then I put that binder away. But I keep the vision in mind. I once heard it said that if you were going to see all of the things you were going to do all year you’d be absolutely crushed and overwhelmed. There are so many things we do each day and week that we don’t really take stock of while we’re berating ourselves for not having completed the other projects we’ve decided “should” be done. This year, instead of making New Years resolutions, I made a list of all of the accomplishments big and small that I had done in 2015. Audrey and I both did it, in fact. We sat flipping through our planners (she has her own which we use to schedule our week on Sunday nights at dinner together) and saw all the things we had done. Then we looked through all the photos month by month on my computer as well. And then I just sat and looked through my accomplishments starring the ones that really meant something to me- like making the book of letters for Audrey, helping her audition to sing at the school talent show, taking our first real vacation together to Bermuda last year, attending a benefit concert for Dan and watching Audrey get up on stage and sing Fight Song with Rachel Platten. And then there were the less than thrilling items, but accomplishments nonetheless- going to jury duty, surviving our first case of lice, and getting an endoscopy of my esophagus. Surviving those are accomplishments to be proud of as well. 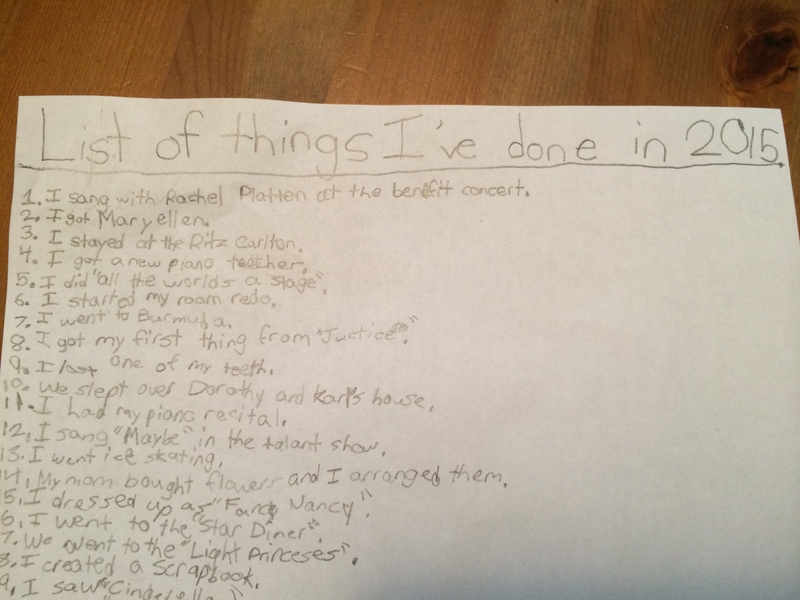 Audrey’s list (pictured above) included lost teeth, piano recitals, and learning how to ride a bike. We live in a society that likes to get things done quickly- Amazon now eerily delivers packages the same day you order them. But sometimes growth doesn’t happen fast- and immediate gratification isn’t an option. But if you are still holding on to your vision- and still taking steps towards it- even if it’s taking years…that’s OK. Being in process is being alive. And instead of looking towards new resolutions and new results, I am choosing to look at progress made- however slow-going. Years ago I sat looking through black and white photos of my father in law when he fought in Vietnam. On the back of one of those black and white photos, was a Longfellow poem, and it’s become one of my favorites. In fact, I wrote about it when I was a newlywed living in Brooklyn with my husband in an essay for “This I Believe” here. If you are further today than you were yesterday, persevere. Keep the vision in your mind and keep taking small steps towards it, when you can, with whatever strength you can. You are making progress. Made me cry, so achingly beautiful. You give me courage. Small steps. Grief and the time warp – yes! I was tempted to cancel my 8 am yoga class, but I will get up and go. Showing up is progress. Wishing you a peace filled weekend. Thanks Terri. You give me courage also. Comforting words… I have to remind myself that it’s “okay” if I don’t get to all of the things on my to do list. I’m an only parent with two children and they come first. Sending hugs your way Julia. The book of letters is breathtaking. Thank you for this encouragement; I’ve never thought of using my planner to keep track of accomplishments, and now I’m intrigued and hopeful that noting progress might help me to continue plugging away faithfully. Thank you. I hope it works for you- not just to keep you plugging along, but to help you stop and take notice of all you’ve done. Yes, indeed. Thanks for that reminder as well. This is so lovely Julia. It’s true, when you look back on a year it’s astounding how much has been accomplished. Your photo book is breathtaking and such a tremendous gift to both you and Audrey, and all those who contributed and loved your husband. I used to skim over what I’ve done, but the last few years I’ve been more generous to myself and proud of each and every step. Well, just from what I see in the online world, I’m impressed by your consistency and commitment! It encourages me to keep going also, so thank you.